Frankfurt Airport’s most popular parking facility will be moving soon: on December 3, the Holiday Parking lot of Germany’s largest aviation hub will be shifted closer to the apron. This won’t significantly affect the time required to get back and forth. The only major change is a welcome one: the number of spaces will rise from 1400 to 2,100 in response to the enormous increase in demand in recent months. 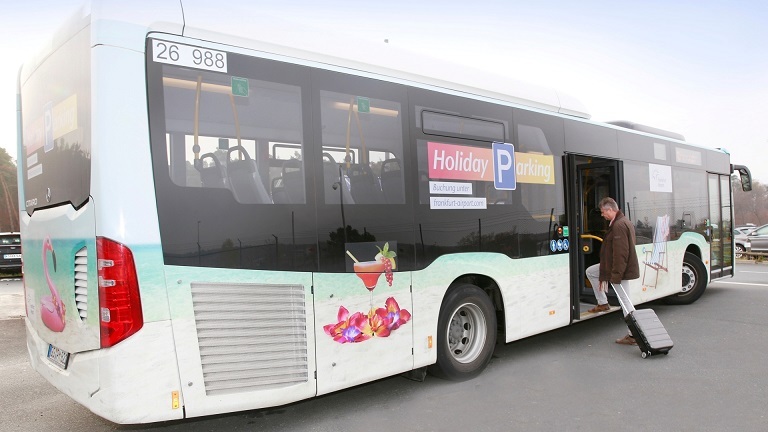 How does Holiday Parking work? This parking lot is located in the south of Frankfurt Airport and easy to find by following the signs. The price for one week starts at 29 euros and varies depending on when it is booked, when it will be used, and the anticipated demand at that time. Payment can be made by credit card or PayPal. Advance booking is required, since the lot is located within the area of airport operations. Subject to availability, it is possible to book a space on the Holiday Parking Lot between 24 hours and nine months before flying. There is a free shuttle bus service between the lot and the terminals every 30 minutes. Would you rather share a car? The two car sharing services operating at FRA will also move soon. Starting on December 17, the cars of Car2go and Book-n-drive can be found in bay 611 of the parking structure opposite the departures level of Terminal 1. Detailed information on the many services available at Frankfurt Airport is available to passengers and visitors on its website, at its Service Shop, and on its Twitter, Facebook, Instagram and YouTube social media pages.